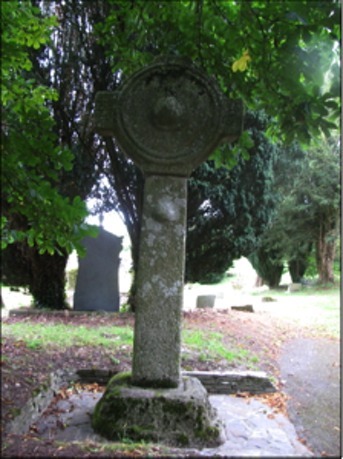 This page highlights the crosses at Ballymore Eustace, in County Kildare. It includes an Introduction to the Site, and a description of the Images on each face of the cross. The town of Ballymore Eustace is located in County Kildare, south of Naas on the R411. It is just west of the N81 from Dublin. The name Baile Mór na nIústasach means “big town of the Eustaces” in Irish. Little or nothing is known of the history of the site before the twelfth century. When it comes to notice, Ballymore consisted of a manor and castle belonging to the Archbishop of Dublin. 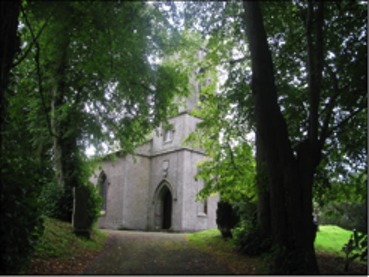 The remains of a twelfth century church dedicated to the Blessed Virgin Mary can be seen to the east of the present church, Saint John’s Church of Ireland. Ballymore castle was constructed as part of the defense of the Pale. Originally simply Ballymore, the town and castle became associated with the Eustace family when in 1373 Thomas Fitz-Eustace was appointed constable of the Castle of Ballymore by the Archbishop of Dublin. The last Eustace to hold hereditary title was Nicholas Eustace who died in 1577. The presence of two high crosses estimated to date from the tenth century suggest that there was a monastic site there prior to the year 1000 C.E. Both of the crosses are granite. The site and the present Saint John’s church is on the east side of town in a wooded area. There is a signpost on the road. A narrow lane leads up to the church which was built in 1820 (see photo above to the left). The South Cross: Standing south-east of the church is a broken cross. Only the bottom part of the ring remains. The shaft is just over one meter high. On each side (though difficult to see in the photos below) there are panels that are framed by a roll moulding. Whether or not any figural carvings existed in the past, none are visible now. 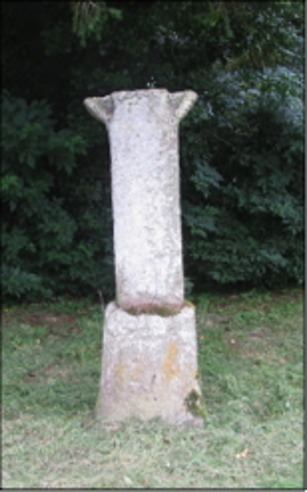 The base of the cross is tall and tapering and over half a meter high (see photos below). The photo on the left is the east face of the cross and that on the right is the west face. 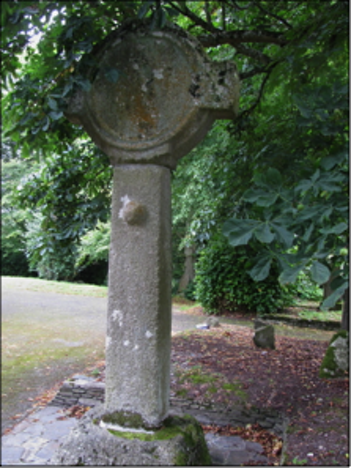 The North Cross: This cross is in two pieces, the shaft and the head being separate. It stands three and a half meters tall and across the arms it is just over one and a half meters wide. The head of the cross is imperforate. The east face has two circular raised ribs. There is a boss near the top of the shaft. The west face is very much like the east but has the addition of a large circular boss on a setting in the centre of the head. It does not appear that there was any figural carving on this cross. When Peter Harbison was preparing his study of the high crosses, published in 1992, the north cross was leaning at a precarious angle. 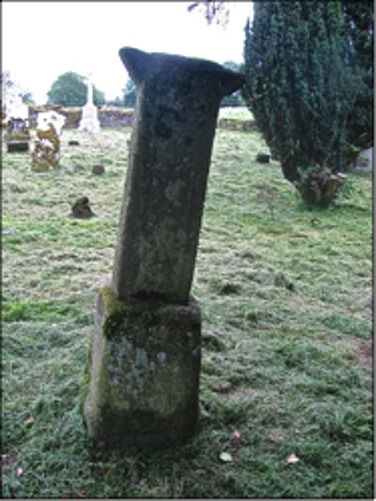 Heather King reports that an inspection in 1998 by the National Monuments staff of Duchas The Heritage Service led to the cross being taken down and repairs being made. A portion of the report, written by Heather King reads, “An examination of the mortice showed that the shaft was sitting in the base without any mortar, and there was a gap of c. 20mm on three sides between shaft and mortice. The cross shaft had no tenon and sat loosely in the mortice to a depth of c. 0.3m. The mortice was over double that depth but bellied inwards at c. 0.3-0.35 m below the upper surface resulting in a narrowing of the mortice, which did not permit the shaft to be seated securely in position.” (http://www.excavations.ie/Pages/Details.php?Year=&County=Kildare&id=356) The base was excavated. It proved to be a granite boulder with a stepped pyramidal shape. The base was reset and the cross re-erected for at least the second time. In the photos below the left image is the west face and the right image is the east face of the cross.